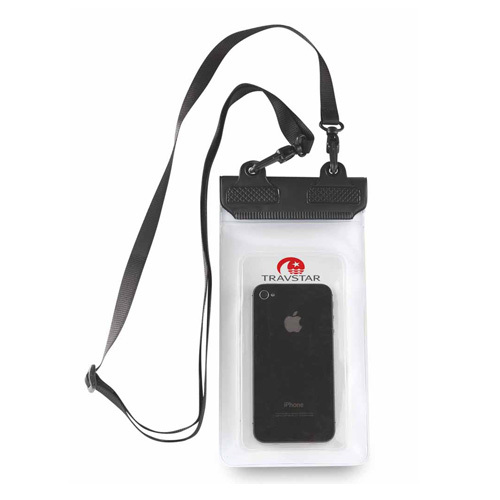 Waterproof Cellphone Case Keep your cellphone handy yet safe at the pool, beach or boat when you keep it in this waterproof pouch.Ideal for promoting resort destinations and service providers, this protective carrier can be imprinted with your company name or logo for added personalization, and comes with a separate, detachable lanyard. A great addition to employee incentive programs or fundraising gift baskets. Keep your gear safe from water damage while building brand awareness! Polybagged / 36 lbs / 200 pcs. / 18" x 14" x 19"box.